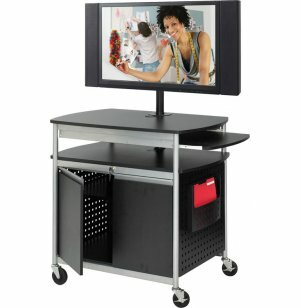 Get your audio–visual presentations moving with Safco’s "Scoot" Flat–Panel Audio Visual Cart with Doors. Its sleek design, high–quality construction and practical features make it a winning choice for any school or business. 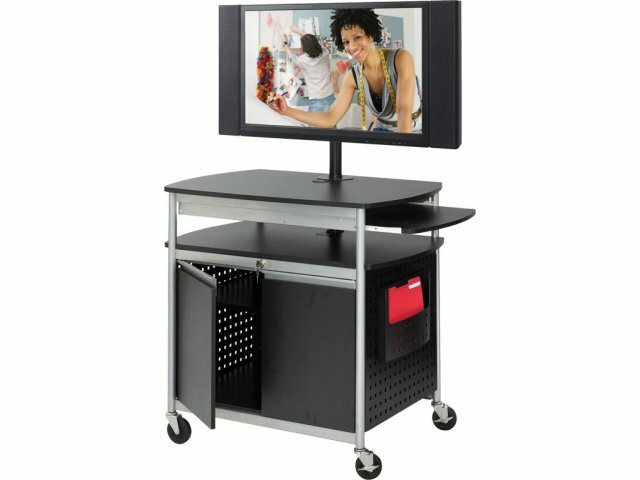 The Flat–Panel Audio–Visual Cart can hold a wide variety of monitors, from small units up to 42–inch screens. It features a top surface and shelf for laptops, DVD or CD players, as well as a pull–out shelf for extra convenience. The locking cabinet can be used for all–around storage of expensive equipment, or for devices used during a presentation. With a detachable side pocket, you can even bring along files and notes without the added burden of a separate notebook. So let your school or business enjoy the all–in–one convenience of Safco’s Scoot audio–visual cart. There's never been a better way to stay on the go. High–Quality Construction: All–steel construction makes this audio–visual cart extra–durable and built to last. Professional Design: The combination of steel frame, black laminate and perforated cabinet sides give this cart a sleek, professional look. Versatile: Accommodates flat–panel monitors of any size up to 42". Total Storage: Generous shelves and lockable cabinet can hold all equipment necessary for audio–visual presentations, including laptops, DVD⁄CD players, and more. Smooth Mobility: Four casters — two locking — let you move smoothly from place to place and keep the cart secure when not in use. Electrical Assembly Included: Includes UL–approved electrical assembly with surge protector for fast hookup of all electronic devices.